There’s a bit of a debate in the soap making community as to which types of fat to use for the hardening fat. Lots of people like palm oil. It’s cheap, plant-based, and works. But the harvest of palm oil is also threatening a lot of vulnerable real estate and species in the tropics. And the people that harvest it don’t really have a great time doing it. Beef tallow, on the other hand, is from cows. Some people don’t like that. As a vegetarian with environmental reasons I found myself a bit conflicted when I started making soap. Start with some ground fat from your butcher. 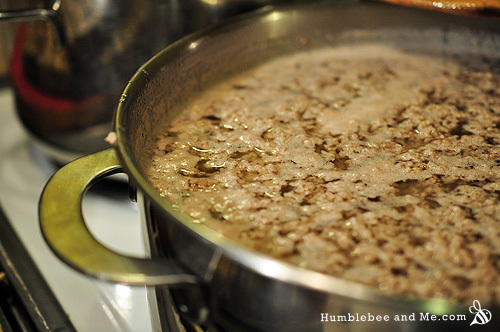 It will look like pale ground beef. I ended up settling on using tallow. The cow is already dead, and the tallow would just be thrown out if I didn’t use it. I can get it for free from my local grocery store meat department, and the guys working there always look happy enough. 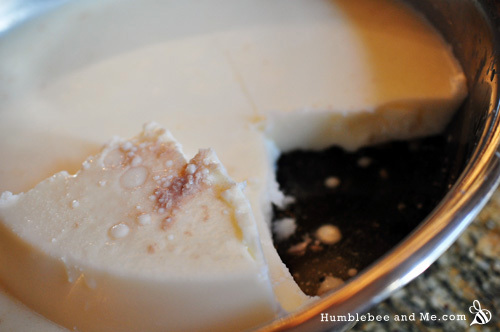 Rendering your own tallow for soap making is really easy. Start with beef tallow from your local butcher. Have them run it through the grinder before they give it to you. Otherwise you’ll want to mince it or send it through the food processor before you begin. Put the tallow in a large stock pot with a little less water than necessary to cover it. You don’t want to use too much water, as it will prove rather annoying further down the line. You're done cooking when it looks like this. Heat the tallow/water mixture until it’s steaming. Cook until the remaining meat is brown and you don’t see any white bits. The liquid should be a yellowish colour. After the fat/water mixture has chilled overnight, you'll be able to lift the fat off the top. Make sure you rinse it to get rid of the icky bits. 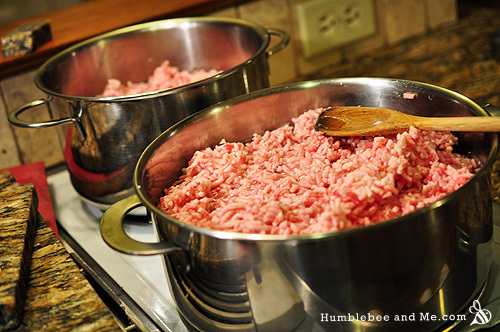 Pour the mixture through a fine sieve to remove the meat chunks. Chill the fat/water mixture overnight (I just put mine out on the porch as it’s rather chilly these days). The fat will float to the top in a thick layer, at which point you can pick it up, rinse it off with cold water, and store it in the freezer until it’s ready to use. What are your thoughts on the palm oil vs. animal fat debate? Remember, every post you comment on is an entry in the monthly draw! I recently read your article on palm oil vs. animal fats. Did not take much thought to weight the two. I have never made soap before. I have always wanted to. My husband and I have started our journey as vegitarians. We are interested in any articles that lends to us a more healthy life style. I will be trying soap making soon as soon as I invest in all the necessary items that I don’t already have. I will let you know how it turns out. Thank you for your free and very helpful knowledge. DawnC. I’m so thrilled to hear you’re planning on taking the dive into soap making! I got all the equipment I needed (mostly a big pot, a few spoons, a dishwasher safe juice jug, and a loaf pan to use as a mould) at Value Village for ~$20, which was very reasonable. And congratulations on your vegetarian journey 🙂 I’m a few years into mine and enjoying it immensely. Be sure to check out the food recipes I have up here, I always post my favourites. These bulgur nut veggie burgers are especially delicious! I am a vegetarian and up until reading this entry would have been against using animal fats in a soap. I don’t like to use palm oils due to sustainability factor so this actually makes sense! I think you have swayed me….but possibly only organic! wouldn’t the fat of non organic still have the nasty hormones etc in? i am still new to your site so am steadily plodding through it … do you share how to make natural soap? do you mind me reblogging? Another Marie! Fantastic! There are not nearly enough of us in the world 🙂 Especially vegetarian Marie’s—we are a rare breed, lol. You make a good point about using organic lard/tallow—I should really look into sourcing some here! Unfortunately we don’t have any organic shops that are large enough to have their own butchers, so I’m not entirely sure where to start. Hmm. My basic instructions for making soap are here, and then there are tons of individual recipes here! What do you mean by re-blogging? I’m not really that keen on having my content re-published on other websites as I don’t get any traffic that way (and there’s just so much on here I want people to be able to find it!). We live in a very rural area, Montana. I must note that we are not vegetarians. But I can give you a few ideas on tallow. In this area there are a few farmers who are embracing the grass fed beef idea, who do their own butchering or have it taken to a smaller locker plant. If you are an extrovert and don’t mind talking to this great breed of people you can always ask were they get their butchering done. The best fat to get is the fat up around the organs, it’s harder and cleaner ideal for soaps and salve, and like you said it’s a by product that is usually thrown away. Although, I will say we do our own butchering and I am enjoying saving/using as much of the animal as we can. I make goat milk soap that I’m trying tallow in and we’re excited to be trying tallow lotion bars. I’m really on here just to look for more soap recipes, and your rendering guide is great. I cook a potato in my rendered fat to clarify it, it seems to make a clearer tallow with less smell. We enjoy knowing exactly what goes into the products we use and a few of us have major skin issues. Thanks for the tips, Jenn! I recently found a new supplier at a local farmers market. Alberta is “beef country” up here in Canada, and he was thrilled to have somebody interested in something he hasn’t been able to otherwise sell. I will have to negotiate a better price with him next time, though, as it ended up being about 80% waste (meat, that is—it went to the neighbors for dog food). Jenn, how exactly do you cook the potato with the tallow, is this during the first cook, or are you cooking it twice to kind of deodorize the fat? I am also a vegetarian and made my first couple of batches of soap with (“sustainable”) palm oil. I read your article and haven’t felt quite right about it and so I contacted a local farm and am buying organic fed lard from them to use in my next batch! Thanks again for all the wonderful soap inspiration, and for making me think! Hi Brenda! I’m so happy to have made you think 🙂 That really was the entire point of that article, though of course I’m extra happy when people end up agreeing with me, haha 😉 Enjoy your beautiful homemade soaps, and do let me know what you think of lard vs. palm in terms of performance. You should definitely try tallow as well—I think it’s my all time favourite! I find that tallow or lard made at home has a “animal” smell, I am not a vegetarian but I don’t like that smell in my soap and I do find it does remain in the soap. You can try multiple cooks with multiple batches of water to further leech out the scent—some people throw a roughly chopped potato in with those additional cooks to help absorb some of the scent. Alternatively, you can purchase deodorized, pre-rendered tallow. That’s what I’ve started to do as I got really tired of the smell of the render filling my house for days. Re blogging as in a link to your site … that should be fine shouldn’t it? I was torn– don’t like the idea of palm and what’s happening out orangutans, but also don’t like hormones in meats. So I asked at my local grocery store. Today I picked up 4 pounds of grassfed beef fat, and they didn’t charge me a penny! It’s in the pot now. Ahh! I am so jealous! I really need to get my act together and do that, but I so rarely shop at a grocery store that actually sells meat, haha (most of my grocery shopping is done at a fruit & veg shop). As for which soap to make first—why not a Christmas soap? My hot chocolate one is a great starter recipe! That recipe looks amazing (although I would have to keep reminding myself not to taste the batter, no matter how luscious it smells!). But I have almost none of the add-ins on hand, so need to track them down. The only problem I have with with soapmaking is that it takes so much essential oil to fragrance a single batch of soap, and they are so expensive! Ha! Yes, don’t do that lol. For this soap you can totally leave out the absolute, it’s pretty expensive, and you can just use vanilla or some other dessert-y type EO instead. As for soapmaking being a bit pricey on the EOs… yeah… it’s rather annoying. There are cheaper EOs that I generally prefer to use for soap making—citrus, spice, and lavender are all pretty affordable, especially if you buy the 100mL bottles. This post is extremely useful! Should I cover the pot when it’s cooking? I ended up with some odd bits in my tallow, so I removed the solidified fat the next day and then melted it down again in a double-boiler (actually my large measuring cup over a small pan of water). Then I poured it through a small strainer into an ice cube tray and stuck it in the freezer. When the cubes were solid, I pulled them out and put them in a ziploc bag to make them easier to measure out. The excess liquid/fat/whatever ended up at the bottom of the measuring cup, so I could just discard it. I just made my first batch of soap with it and am waiting impatiently for it to cure!! Thanks again for the great tutorial, Marie! I used tallow to make french fries tonight, do you think I can reuse the leftover for soap? I know you can reuse it to fry in again, seems you could reuse it for soap too???? Your thoughts? Thanks! Mmm, bacon soap 🙂 My girlfriend is an absolute baconaholic, and I’d love to make some for her. I assume the SoapCalc value for “Lard, Pig Tallow (Manteca)” would be used for bacon fat as well? Let me know how that bacon soap turns out! I’ve had great luck at more established farmers markets—the type where butchers can have permanent set ups with larger display cases. Just ask them, chances are they have a bunch they can’t sell, or they’ll be able to bring some for you the following day or week 🙂 Just be sure to know which animal the fat is coming from so you can calculate the proper amount of lye to use with it. Do you have Any uses for the gelatin left over from the tallow rendering? Homemade marshmallows are always fun 🙂 I’ve never had any gelatin left over from tallow rendering, though, so lucky you! Since you aliken palm oil to tallow, wondering if I could use that in your tallow balm for mature skin recipe? I have some palm oil I need to use up! Unfortunately no, not for that recipe. The whole point of the tallow is that it’s an animal byproduct, so it has a really similar make-up of fatty acids to our skin, so that’s where the benefit comes from. I MUST AGREE WITH MARIE!!! I was able to get my hands on fresh tallow a couple months ago. We made soap, chap stick, tallow lotion bars (these were from another sight I found when I first started this tallow kick, sorry.) and some salve. I can not believe how amazing these products work!!!! As a society we are so used to just grabbing something off the shelf at the store. But as a family with our skin/food allergies. We have to watch labels a lot-it gets frustrating. So when I finally “found” (MORE LIKE MADE) the time to make some of these products I was over joyed at the simplicity (after the initial learning curve) and the purity of these products. AND YES I DO BELIEVE without a doubt that it’s the genetic makeup of the tallow that helps our hands feel better than they have in years, after MANY products tried. (You may know what I’m talking about, hands that crack and always feel like sand paper except maybe for 15 minutes after a new coat of the latest lotion you just brought home to TRY!! This is even after changing all the soap in the house to either our handmade soap or organic hypoallergenic soap) With these tallow bars my hands are smooth and soft-I don’t even have to use it all the time-the lotion heals your hands!! Marie, I did not get that recipe off your sight and I did infuse a few of my own herbs into the mix (Burdock root and Oregon Grape root, they work great!) But I can’t wait to try your Hand Sanitizing Lotion…I was just thinking the very same thing the other day in town, I want germ free hands but don’t like the “hand sanitizer”. I thought instead of re-creating the wheel I would check here first and there it is…THANK YOU!! Marie, do you think I could use the same method to render lard? TK Ranch in Alberta has leaf lard and beef tallow from pasture raised animals not fed antibiotics or hormones. Just click on Heritage Pasture Raised Pork and then Pork Fat for their leaf lard, or Grass Fed Beef and then Organ Meats and Soup Bones for tallow. You render it yourself. The price for 900g is $6. I’m new to soap making, so don’t know if this reasonable, but I’m going to try it. You order online and pick up in Calgary, Edmonton or more northern locations. They deliver monthly. Call me crazy, but this conversation about grass fed animals got me wondering about my seasonal hunter buddies who are (sadly) deer and moose hunters. Could the fats from a deer or moose be rendered as a suitable fat for soaps or lotions? I’m actually 97% vegan for coronary health reasons (I have some organic eggs once in a while) but as you mentioned Marie, these animals have been killed and if there are parts that could be salvaged and used to honor this dear creature, I’m all for it. And if you are looking for a pure and unadulterated fat, would a wild animal such as a deer or moose render something quite good and certainly unique? tallow or lard. Here in Greece, they don’t sell ready tallow or lard. Can you suggest with what should I replace it ? Can I render fat from goats? My DH has a co-worker that raises meat goats and we usually get one a year from him. I could save and render the fat from that if it would work. Also which is better, tallow or lard? I’m in the south west US and lard is very common here in grocery stores, and fairly inexpensive. Hi Silvia! You definitely can 🙂 A reader has even sent me some bars of soap she made using goat tallow from her goats, and they’re beautiful. I prefer tallow for soaps as it is harder, but I will happily use lard if I’m out of tallow—you just might want to use 5% more, or give the bars a bit more aging time. I use lard in almost all of my soap. I add coconut oil, olive oil and sometimes palm oil. Also I’m experimenting with canola oil to replace some or all of olive oil. If I’m low on lard then I use some Crisco. Of course this is using a lye calculator. I’ve been trying to get rendered tallow, as I really don’t have the time to render it myself. Fortunately we live in an agricultural area where lard is available and inexpensive. So I make do with lard. Just recently I had a lard problem of my own doing. I found a partial container way back in my frig. The smell did not seem quite right but I used it anyway. We were getting low on family use soap, which I usually experiment with anyway. The soap traced in front of my eyes with hardly any mixing and was solidifying in seconds, not minutes. Well, I got it in a mold and we shall see…..
Hi Doreen! I love soaping with lard, and often do as I can buy it at the grocery store for next to nothing. Even here in cattle country tallow requires a bit of searching, rendering, and forethought before you can soap with it. Hi Chelsea-I too would happily use the human/fight-club method, if offered! I just wanted to say that in the uk there are alot less of the huge-scale, industrialised meat-factories than in america (although still too many), & I am lucky living in a very rural area, with LOTS of small-scale, very caring animal-rearers, and small butchers-some of whom have their own abbatior, so its a whole different kettle of fish, so to speak. I think I would feel differently if I didnt have this option-I was vegetarian for a long time & stopped only because I felt I would make more impact on the lives of animals by demanding ‘happy’ meat, rather than be fobbed off with mushroom lasagne all the time! Ha! Way to perpetuate weird pop culture ideas about soapers 😛 Jokes aside, it’s fantastic that you are able to support local, kind meat production. Also, can I fob off with your mushroom lasagne now that you’re done with it? It sounds delicious! There is no excuse to use palm oil: even the supposedly sustainable stuff-we need to reduce our dependency on palm oil. In the UK there are plenty of small abattoirs and butchers that only deal in happy, free-range &/or organic meats-its a crime to waste the fats. New soapmaker here – thanks for providing us with such amazing resources and discussion! I’m particularly interested in this one, as a vegan gal myself. I choose to use (“sustainable”) palm oil to the minimum requirements in my soap for two main reasons. First, even though tallow or lard is considered a waste product of the industry, I disagree with the view of animals as commodities in any sense. I feel that by buying animal fat (or providing free disposal for it) I would be promoting a viewpoint that I fundamentally disagree with. I don’t feel right supporting animal agriculture in my food choices, so I don’t do it for a hobby either. That said, if somebody offered me some human-fat for soap (ala Fight Club) I would be totally down (as long as I didn’t have to hoist it over barbed wire). That’s the wastefullest (yep) waste product there is. Secondly, animal agriculture is also immensely damaging to the environment and I feel palm oil, responsibly and moderately used, is less of a concern for our planet in the long run. Granted, small ranches are a lot less damaging (I grew up in US “cattle country”, so I get it) but they don’t make up enough of a supply on their own, and I can get by with plant-based oils to my satisfaction. I’ve definitely thought about it – but I’m so new, I don’t want to waste ingredients trying to formulate my own recipes. I’ve tried entering my own into SoapCalc without palm and they were a slimy mess. Until my process is free of embarrassing failures (thank goodness for the “hot-process rescue” method I found) I think I’ll stick to using other folks’ recipes. 🙂 Someday, maybe! Until then, I would *so* love a palm-free vegan recipe if and when you publish one! That’s totally fair 🙂 I did get started making nothing but vegan soap, and formulated several lovely bars that just ended up being very soft. Now that they’re about 3.5 years old I should break one out and see if that’s long enough to get nice and hard, haha. I like to think there’s no such thing as a soft bar now… just one that hasn’t aged long enough, haha. Ha! I’m thinking now that I’ll have to “lay down” some palm-free soap like expensive old wines. Hahahaha yes! I’ve also wondered about using a dehydrator to speed along aging. Hmm. Hello! I am so LOVING your blog! I have just in the last couple of years acquired empty nest syndrome (LOL) and thankfully some of my favorite blogs and pinterest have renewed the crafting bugs within me. In addition to sewing, crochet, and cooking, I have recently come to LOVE soapmaking. I’ve made soap many times over the last couple of years – but still consider myself a beginner, learning and absorbing as much as I can. I was particularly thrilled this morning to find your blog. What a wealth of information! And your soaps are so beautiful! I can only imagine how wonderful they smell. I have a couple of questions for you, if you don’t mind?? 1) I LOVE the idea of using tallow. We have a local butcher/meat company and I think I can get beef and/or pork fat from them for using. I have previously made soap with palm oil but have read the huge concerns with using this product. Thank you for explaining your decisions to use tallow/lard and how to make it at home. Local is always better in my book, if I can get something that will work. And considering the historical use of this product in soapmaking, I like the idea even better. What about using fry grease/oil? I’ve read of a mission project (Lovin Soap maybe?) where soapmakers teach people in other countries to use leftover fry grease/oil to make soap. Have you ever used oil as opposed to a solid fat for making soap (not sure how it would be referred to in a soap calc?). I have a friend with a snack counter in her bowling alley and boy, if I could find a way to turn her leftover fry oil into soap, that would be fun to try! Where did you get your awesome soap mold? My husband made a mold for me and I keep trying to think of a way to make it adjustable. I spied the block you use in the middle. Is it a tight fit? Does any soap leak to the other side? One final question – any reason you use New Directions for your soaping ingredients, as opposed to Brambleberry? I have used Brambleberry for most of my ingredients, but mostly that’s because it’s the first company I discovered. I get local ingredients when I can. I do notice that Brambleberry doesn’t seem to carry some of the essential oils you use (Cajeput, I had not heard of)? If you have posts answering my questions, please ignore me and I will just keep exploring on your blog. Can’t wait to try some of your recipes! I would love to help my soaps look a little more professional and hopefully with your blog, I’ll be able to do that. **I made Earl Grey tea soap this past weekend using Bergamot EO. What a wonderful scent and the soap is a light caramel color from the tea. I’m hooked for sure! Woo hoo! Hi Gina! I’m so thrilled you’re loving my blog 😀 I have had discussions with readers about using post-fry oil for soap, and the general consensus is that it should work—cooking with an oil shouldn’t change it’s SAP value unless the oil undergoes a chemical change (burning it comes to mind, haha). You’d just proceed as you would with any other oil in SoapCalc, so you would need to know exactly what that oil/fat was. After that it should behave just as that oil would in any other case—lard will harden, olive oil won’t, etc. I haven’t tried it, though, because I never deep fry things. My dad made me my soap mould. Here’s an entry with specs 🙂 The blocks aren’t as tight of a fit as I’d like, in the future I’ll be looking into coating the edges in silicone to try and improve that. I’m Canadian, so that heavily influences where I shop. I do not want to deal with international shipping costs, currency exchange, and customs, so Brambleberry and any other international suppliers are off the table for me. Your Earl Grey soap sounds lovely 🙂 That’s one of the very first soaps I made, except I added tea leaves (and FAR too many!) so it ended up being a VERY scrubby bar! So, I’ve ventured into the land of rendering thanks to your amazing insights. In my first batches of soap I had used grass-fed rendered tallow from US Wellness Meats. It came out amazing, but at nearly $10/lb, I felt I needed another alternative. Today I rendered fat trimmings from my local butcher. Admittedly, I do not know the origins of the trimmings. I have noticed that the tallow has a very distinct beef smell. I’d like your insight on this. Do you think it relates to my “unknown origin” or perhaps I could re-melt it and strain it through cheesecloth rather than my fine metal sieve? I realize this is a rather tricky question for you to answer, but would love to hear what you have to say. Hi Rachel! If you’re getting a beefy scent from your tallow I’d recommend doing a second rendering, and tossing a peeled potato in with the fat while it simmers 🙂 The potato should help absorb some of the scent and give you a cleaner final product. Good luck! I, too, am a fan of your blog, and enjoy reading of your adventures. Thanks so much for sharing. A question about rendering….I did as suggested, having the local butcher grind the fat he collected for me, and boiling it with not quite enough water to cover. I’ve strained it, and let it solidify, but find that the resulting fat is very soft. I remelted it, thinking that might cause the moisture to sink and the fat to rise, but it is the same consistency….very soft. Do you think melting it yet again and pouring it through a cheesecloth might help make it harder? It is very spreadable, not hard at all, right now. Hi, I am brand new at this and hoping to make my first soap this weekend. I rendered tallow and I am interested in making tallow/coconut oil soap but cannot find a recipe for the life of me. Can you point me in the right direction. Thanks! Having raised three boys after their dad passed, there were times I forgot I was a girl. Your blog has inspired me to tap into that creative vein left dormant for many years, and it’s been a joyous journey for nearly a year now. 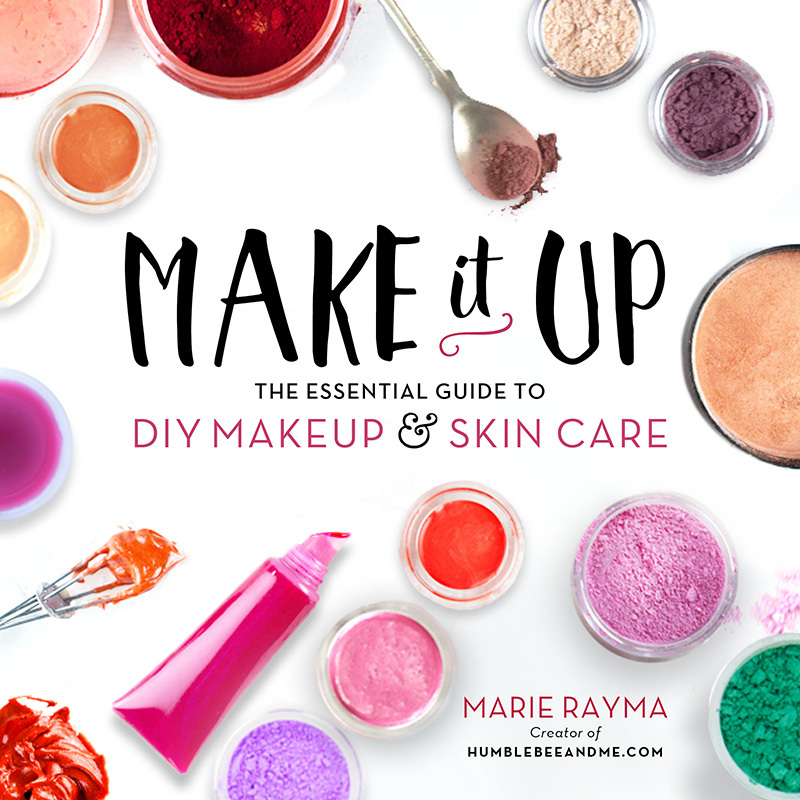 Lip balms, lotions, salves galore…but always I shied away from the thing that brought me to you in the first place: soapmaking. Until yesterday. I rendered lovely tallow for the first time ever by following your wonderful directions. With my immersion blender, lye, essential oils by the dozens, and pots and jugs, I’m ready at last. Hi Mrs C! I’m so honoured to be part of your creative DIY journey 🙂 Congratulations on taking the soaping plunge, I can’t wait to hear how it turns out! Thanks for the post. I’m just beginning my research on all things DIY. Your use of Tallow really interested me when you explained it…so I’m wondering – I often cook a whole chicken or ham and make as much as I can with it, including my own stock for soup, etc. I typically pick off as much meat as I can and then everything else (skin, bones, any fat, etc. from the animal) goes back into the crock pot covered w/ water to make my stock. After straining that and refrigerating, I almost always have a thick layer of fat that looks exactly like your picture on this post of the “done” tallow. Is what I’m seeing on top of my stock the same thing? I only wonder because you are starting with mostly fat, I am starting from the whole animal (or large chunk of it). This would excite me if it’s the same since I have felt guilty for throwing it away, sure it could probably be used for something, but I never knew what!! Thanks for the help! Hi Jenn! Thanks for reading 🙂 Tallow as I’m talking about it is beef fat (though you can also get bear tallow and tallow from other animals!). Different fats have different SAP values—that is, they require different amounts of lye to turn them into soap. So, if you can find a SAP value for the specific fat you’re using, you can use it to soap with. Soap Calc has quite a few, including chicken fat 🙂 I’d just recommend keeping your fat simmering to one animal at a time so you know what you’re working with and you’re good to soap away with it! Hey Natalie! 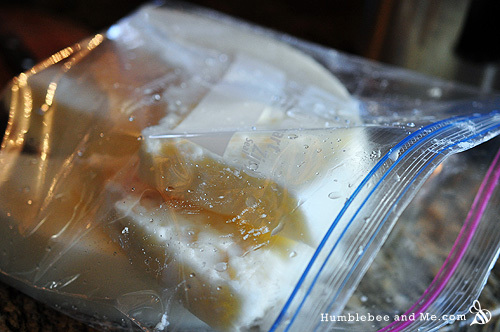 I store the tallow I make in the freezer in chunks, and pull out bits as needed. I don’t cook with it, but it seems to do well for at least a year in the freezer. Approximately how long is the cooking time? That depends entirely on how large your tallow chunks are. If it’s all ground then you could probably get away with an hour or two, but I recently did a batch with fairly large chunks and I simmered it for a good 24 hours. Wow, 24 hours! I will be sure to cut the pieces small. Thanks for the prompt response, love your website and wouldn’t even think about tallow if not for you. Wondered if you ever tried using the stick blender in the pot to chop finer after it cooks a bit? 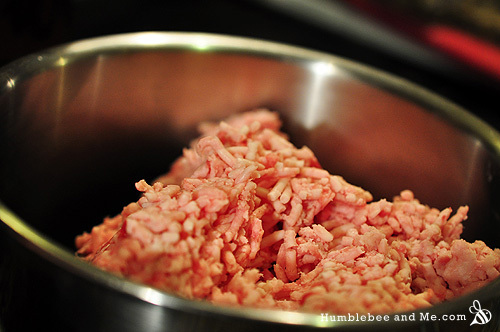 Updating my progress… my neighborhoood butcher gave me 4 lbs of Beef Fat (picked it out from their scrap garbage can). I cut into 1″ cubes and chopped it in my food processor. I then cooked for about 4 hours. I did notice that there were some big chunks yet (food processors are notorious for uneven chopping, even if you do a little at a time and pulse). Anyway I used my soaping stick blender, directly in the pot and ended up with a puree! It got me worried that maybe that was too fine… Anyway I let it cook another 40 minutes or so then strained it. But because it was so finely pureed, I used a paper coffee filter inside of my strainer to be sure all the fine particles were removed. It worked well. After refrigeration overnight I was left with a little less than 2 lbs of beautiful milky white Tallow! Something out of nothing! Thanks so much for your instructions and recipes and mostly for your piece about why you use Tallow. I feel good about not wasting and making something useful out of something that was going to be thrown away. Fantastic! Congratulations on rendering your very first batch of tallow, how exciting 😀 And I love how your stick blender idea worked out, that’s awesome! I just rendered up ~30lbs of tallow (which gave me around 26lbs of rendered tallow) so I won’t be needing more for a while, but I’ll be sure to try your trick next time I do 🙂 Happy soaping! Wow! That’s a fabulous yield percentage and a LOT of Tallow! How Wonderful! I’m pretty stoked—I’m set for ages! Thank you so much for your site and also this post! Ive been into soap- and cosmeticsmaking a few years ago. Most of the soap-recipies I found, used palmoil which I didn’t want to use once I rechearched it. For the same reasons you mention in this piece, i thought of using local animal-fat. I could not find how to process and clean it though and I haven’t got around to it to just give it a go. Also i suspected to find a lot of “green folks” like myself on the soap-forum i was at, but instead I found people who liked the Lush-alike colours and smells and who didn’t support my search for doing it the natural way. So Im gratefull to find your site and to see you seem to have the same attitude towards this all. Ur site is already very helpfull and inspiring! Thanks so much! Kind regards from The Netherlands! I made some beef tallow laundry soap with the thick slab of fat on a beef roast. This soap is now a few years old and still smells of “cow” (the eucalyptus faded very quickly.) I’m working on a batch of tallow bath soap and found that if you remelt the tallow in a new batch of water a few times it reduces the smell and cleans the fat perfectly. I use the same amount of water to fat and just let it set in the pot. It took about three days and 7 remelts to reduce the smell enough for my fussy nose but I just did it between other cooking chores. I hope you find this helpful. Also, have you had any luck keeping eucalyptus stable in cp soap? Good tip! I’ve also read that throwing a quartered potato in the water can help soak up some of that meat scent. How much eucalytus EO are you using, and what kind? I find globulus is stronger and longer than radiata, which is quite a bit softer. I’m not sure what Eucalyptus species it was as it is not listed on the bottle, I live in Australia and we get it by the litre. I used about 10ml per pound and it smelled strong for about a month. Ah, wow, a litre! Ha! Anyhow, it sounds like you are using nowhere near enough—the rule of thumb is 30g EO per 500g of fats, and it sounds like you are using less than a third of that (since EOs are lighter than water). Try upping the amount, that ought to help. I rendered tallow about a month ago with basically this same method, but instead of freezing I put it in a bucket on my shelf. Well after a few weeks I went to make some body whip and I saw some questionable brown and green spots. I am now in the kitchen trying this again and certainly plan to freeze this time. My question is about shelf life of products made from tallow. I gave some of my tallow whip to friends to test for me (they love it 🙂 but now I am wondering if I should add a preservative. My tallow whip has no water added, but if the shelf life of tallow is so short I feel I need to preserve it. I guess I am wondering what your thoughts are on this and if you have a suggestion of what preservative to use. Exactly! From my research, though, cows used for leather are not the same cows that are used for meat, meaning they are raised specifically for leather. Definitely a bummer, but when I look at it from an environmental standpoint, my leather boots & belts last 10x longer than “pleather” ones, so I feel like leather is a better option. There might be certain types of leather the only get from certain cows, just like some stores will only use certain types of cotton and other ones will only use a certain breed of silk… my husband actually work for a butcher shop for six years…. every single cow be it Holstein or Hereford, Jersey, Guernsey or brown Swiss and every single mix in between and then some are used for leather. Every. Single. One. After you boil off and pick off your tallow when cooled… and after you wash… have you ever recoiled it. I run mine through 3-4 times… turns a creamy white… and looses all smell… use large crock with lots of water though…. I have definitely heard many times that this is a good idea. I think I’ve done two boils before, but never 3–4! My problem is I usually buy way too much of it at once and then I feel like I’m racing to render it all… which is probably why the last batch I bought was pre-rendered. I feel spoiled haha. It’s so white, clean, and odorless! Can you explain what you mean in your comment about “recoiling” the washed tallow? Thank you! I am very lucky that my local butcher here in Queensland, Australia saves me kilos of beautiful suet every Monday for me to render for soap making. My question is though, does anyone know if WET rendering in a crockpot works, or do crock pots not get hot enough? I normally dry render on low for hours but without water but am keen to try the water method but want to make sure my crockpot will “boil” like you do in your pots. Any thoughts at all from you or anyone else?? I can’t imagine why it wouldn’t work—as long as it gets hot enough for the tallow to melt (35–40°C) it’ll do the trick 🙂 Happy rendering!